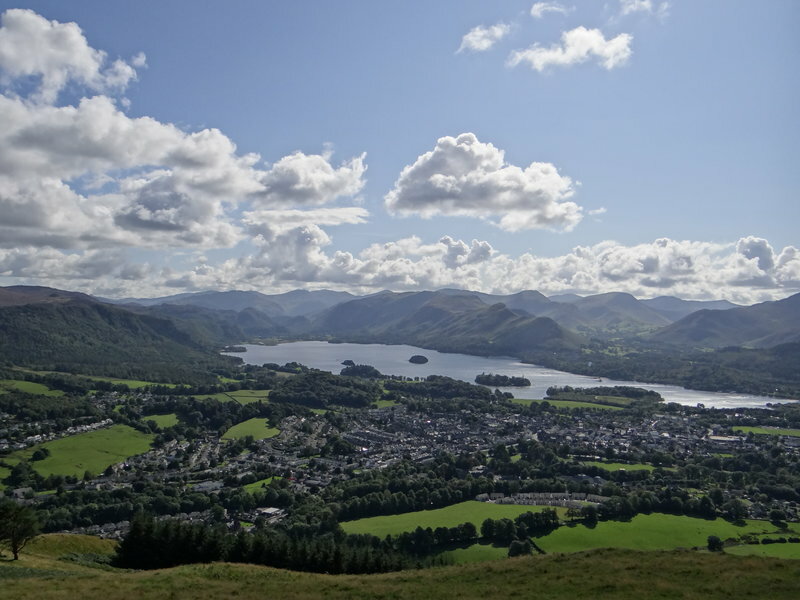 Latrigg, a small hill with stunning views over Keswick and the surrounding fells. This four mile walk is perfect for a couple of spare hours. Two Lakes Derwentwater and Bassenthwaite, a glimpse into Borrowdale and Newlands valleys and a few of the highest peaks Helvellyn and Skiddaw. On a clear day Scafell Pike can be viewed from the bench positioned ideally on top. Walking towards the Keswick Museum from Clarence House, Bed and Breakfast, Eskin Street, pass the Swimming pool and you start to see the summit of Latrigg. Turn Left onto Briar Rigg and walk approx 500 metres till you see the sign for Spooney Lane, a quiet bridleway that crosses the busy A66. Pass Spooney Green house with a variety of Hens running freely in the gardens. 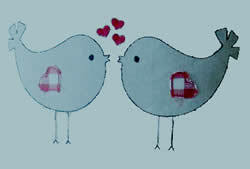 You should notice the sounds of birdsong walking by the side of Brundleholme Wood. Red squirrels are about so do keep a look out. Head straight up the track between Yellow Gorse, Broom and wild flowers. Glimpse through the shaded trees, a patchwork of Green fields towards the tiny hamlet of Applethwaite and Bassenthwaite. This is the steepest section of the walk and only lasts a short time. Follow the path round to the left ignoring the gates on the right into Brundleholme wood. The first viewpoint towards Derwentwater is reached. Sun rays glisten and sparkle on the Lake and light up the sides of the fells into the valley of Newlands. This low level viewpoint is often more sheltered than the summit top of Latrigg. Back to the path and through the peaceful woods leading to a gate to reveal views towards Grizedale Pike and on to Bassenthwaite. Flat pastures with old Chestnut trees dotted around casting useful shadows. The mighty flanks of Skiddaw are well viewed ahead. 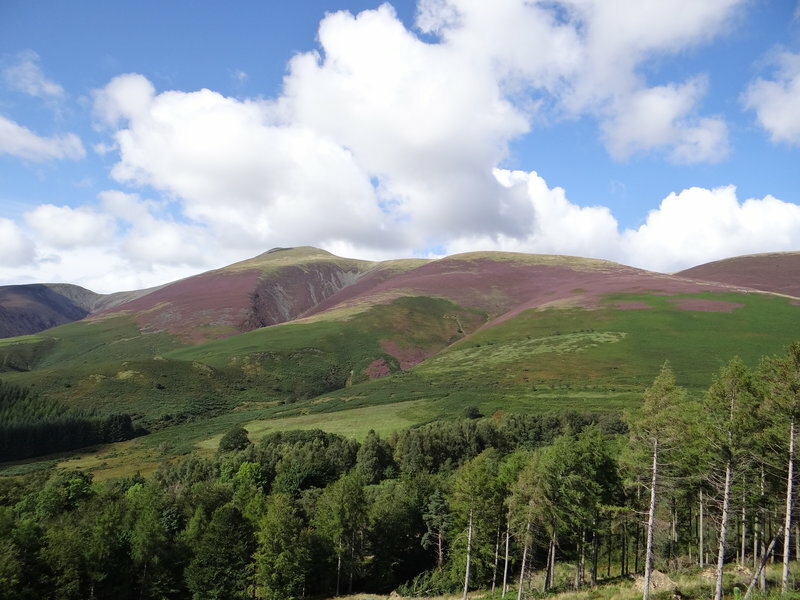 In the month of August it is covered in Heather, a wonderful spectacle of colour . Especially with the light on a late Summers evening. The path soon comes to a crossroads, take the right hand path and zig zag up the side of Latrigg. Views open up, a few Sheep grazing on the hillside could be an useful lead in for a photograph. Nearing the top, the Bench will be spotted, fingers crossed it as no weary walkers sitting taking in the lofty view. The Slate roofs of Keswick below towards Derwentwater, Borrowdale with Great End and Scafell Pike on the distant horizon. Helvellyn and the Dodds on the left with Grizdale Pike and Bassenthwaite shouting for attention on the right. This is a perfect place to stop for a break and take in the magnificent views. Head back down the track you came up, plenty of photograph opportunities along the way. After reaching the first viewpoint, cross the tiny stream and head through the gate into the woods. 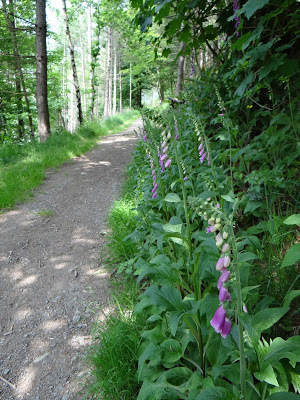 In the month of June wild foxgloves will skirt the track through the woods, a wonderful sight to see, especially with the sunshine lighting the way through the pretty woodland. The path comes to a crossroads, take a right to head back and join the Spooney Lane track and back to the start of the walk. 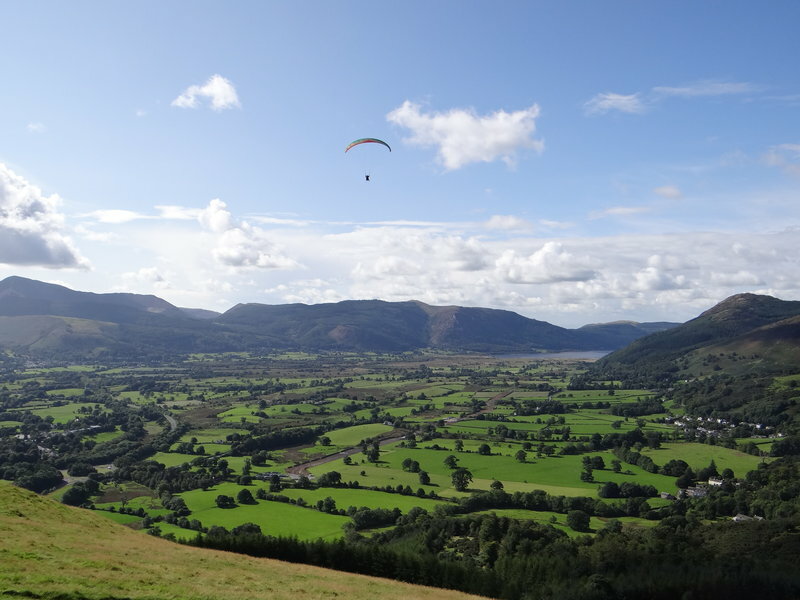 Walks from Clarence House Walla Crag and Ashness Bridge.